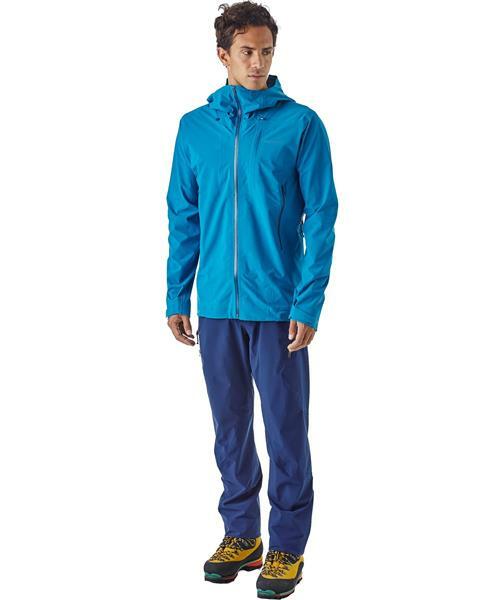 Our waterproof/breathable Galvanized Jacket delivers in the alpine, with a supple, robust 3-layer H2No® polyester/spandex stretch-woven fabric, and DWR (durable water repellent) finish. Yet like many a grizzled alpinist, it’s soft on the inside, in this case due to a jersey-knit backer that wicks moisture and maintains an amazing level of internal comfort. Newly added pit zips enhance venting, and the jacket’s engineered pattern eliminates all seaming across the shoulders and back, resulting in zero abrasion points and unprecedented stretch. The Optimal Visibility Hood works with any helmet and adjusts with our single-pull Cohaesive® embedded cord-lock system. The handwarmer pockets ride high, above harness-line, and close with watertight zippers, as does the exterior chest pocket. A minimal hook-and-loop closure secures the cuffs, which are lined with polyurethane to further eliminate gaps and maintain a seal. The hem cord locks adjust easily with one hand, and the center-front zip has an interior storm flap and non-chafing zipper garage. Now with a concealed Recco® reflector.